Wizkids has started to debut figures from their upcoming DC Heroclix: The Flash set. Up first, they’ve got two version of The Flash! The Flash has improved movement that allows him to ignore elevated terrain. There’s also a cool trait called Speed Force, in which every time the figure moves one square and hits one or more adjacent characters you add a Speed token on the card after actions resolved. You can increase the figure’s speed value by the number of Speed tokens on the card… But there’s more too! Another trait called Faster Than Thought allows him to use Super Senses, and once per turn remove a token to re-roll a Super Senses roll. Also, a special power called Flash Fact allows you to gain additional powers to more tokens you have. When he has two tokes he has Empower, 3 there’s Enhancement, 4 it’s Probability Control. On top of it, they stack! Add in 13 movement with Hypersonic speed, an 11 attack, 3 damage, and natural 18 defense that he can share with Defend for 130 points, and you have the center of a really fun team full of speed. 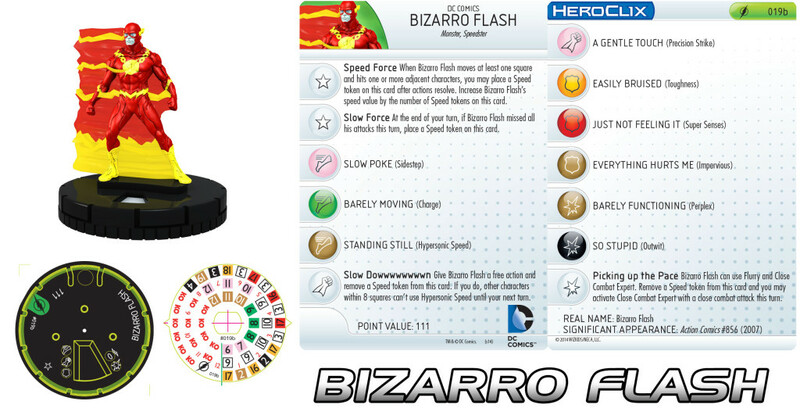 Wizkids has also premiered an uncommon Prime figure, Bizarro Flash. Much like the regular Flash figure, this one can also has the Speed Force trait as described above, where you gains tokens. He also has a trait called Slow Force, where if he misses all his attacks, he gets a token. Bizarro Flash’s attack special power called Slow Dowwwwwwwwn which allows a free action to remove a Speed token from his card. If you do, other characters within 8 squares can’t use Hypersonic Speed until your next turn. The other special power is called Picking Up The Pace and shows up in his mid to late dial. This allows him to use Flurry and Close Combat Expert. Remove a Speed token from this card and you may activate Close Combat Expert with a close combat attack this turn. The figure starts out with Sidestep, Toughness and Perplex that switches to Outwit on click 2. Mid dial he can use Charge which does overlap with both special powers and Super Senses. Click 6 brings the use of Hypersonic Speed, Precision Strike and his special Pick Up The Pace power. Hypersonic Speed allows you to give Bizarro Flash a power action and during his movement make a close combat attack which if he had a Speed token could be used to active Close Combat Expert. Bizarro Flash finishes out his dial with Hypersonic Speed, Precision Strike, Impervious and Outwit. Bizarro Flash comes in at 111 points.